As this year began I debated whether to continue at the same pace, and how to continue–whether to use the random approach I’ve used in the past, which simply reflects my literary whims, or to apply a more focused method to the madness. For example, should I only post about authors I’ve never read before? Or focus on the classics? Or newly published books? Or indie authors? Or take a deep dive into one country’s literature, or into a particular genre? How about a year devoted to Montaigne’s Essays? In the end, I decided to stick to randomness and the same pace (unless I hole up with a stubborn novel draft instead, in which case it will be even less frequent). So, to kick off the year I’m starting with an indie author like myself. 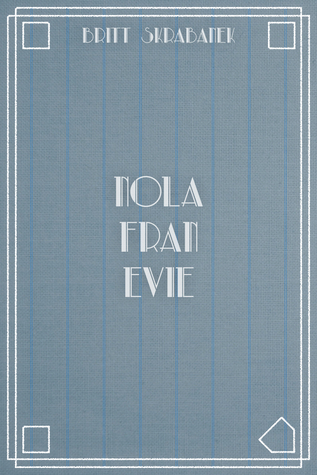 Nola Fran Evie is a novel by Britt Skrabanek, a fellow blogger who like me once lived in Milwaukee and has migrated to the Pacific Northwest. Britt has written a fun, fast-paced story about four determined women. The eponymous Nola, Fran and Evie meet and form a lifelong bond while playing for the All-American Girls Professional Baseball League. (This was the league formed in 1942 to fill the void the war brought to Major League baseball.) There are a few early scenes at Wrigley Field, but don’t expect lots of tense baseball games with pitchers staring down tobacco-spitting batters. This book is about the women’s disparate struggles off the field after the league ended in 1954. The league not only brings Nola, Fran and Evie together but, while in it, each woman meets the man who, for better or worse, will change her life. Much of the action takes place in Chicago during the 1950s, after the men have returned from the war and the women are supposed to retreat to the suburbs to raise families. But Nola, Fran and Evie are not the types to go quietly. Their story is actually a story within a story. The book begins with Jacks, a young contemporary businesswoman in Chicago who is heading to London for a new job, but who feels lost and empty. As she is packing up her apartment, a plate of laced brownies left by a mysterious neighbor and a vintage purse from a keepsake box send her into a reverie about the purse’s owner, who happens to be one of the three ball players. Britt knows baseball and she knows brisk plotting and crisp dialogue. She deftly ties together the story of the “imagined” trio with Jacks’ own story in a romantic, heartfelt way. As I read the book over the holidays, I kept thinking of hot summer days in the Midwest. Give it a try and see if it does the same for you. Wonderful review, Tom. I enjoyed Britt’s book too, you’re right about the “crisp dialogue”, good description. You are most welcome. It’s not exactly the Colbert “bump,” but maybe you’ll get a few new takers. Reading your review, I didn’t think it would be my cup of tea but by the end I decided that it most definitely would be, I had no idea there was a women’s baseball league so now I am sufficiently intrigued to improve my history. Hi Ste J, There was a popular movie made about it a number of years ago, titled A League of Their Own. And Britt mentions a history of the league in her acknowledgements, called When Women Played Hardball. Britt’s book is less about baseball and more about her characters’ lives after the league. Keeping the “madness” coming ! Thanks, Bhupinder. And thanks, as always, for reading. All the best to you this year! Thanks for the vote of confidence! Have a great week, Aquileana.